Kati Meyer-Brühl‘s seating concepts belami and bridge have won the German Design Council’s Interior Innovation Award 2013.
belami‘s distinctively designed, exquisitely crafted upholstered benches, armchairs, chairs and tables were accorded the ‘Winner’ label. The minimalist, ‘mix and match’ concept cuboid sofa bridge was awarded the ‘Selection’ label. 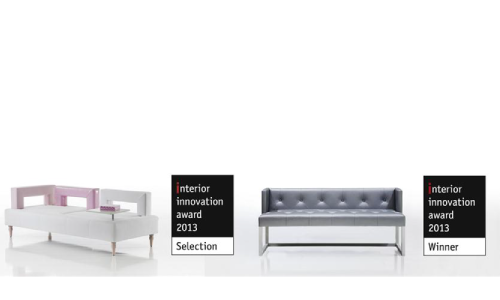 belami will be displayed at the imm cologne 2013 – the award’s conceptual partner – in a special exhibition about the Interior Innovation Award and will also feature at the event LivingKitchen. Kati Meyer-Brühl‘s work is a fusion of differentiated yet also accessible designs, exceptionally high quality craftsmanship and sustainable production methods. industry’s most important accolades worldwide.